California’s medical marijuana law got an endorsement yesterday from a state appeals court: A three-judge panel ruled that San Diego and San Bernardino counties, which have been fighting the state law, must issue government-sponsored ID cards to patients whose doctors say they can benefit from marijuana. The counties had argued that there is no federally approved medical use of marijuana, and the cards condone behavior that violates federal law, the San Diego Union-Tribune reports. But in a sign of just how ambiguous the medical marijuana situation is in California, on the same day the court issued its opinion, federal DEA agents were busy raiding a medical marijuana dispensary in Culver City, in the Los Angeles area. At the dispensary agents left behind trash, counters strewn with open and empty glass jars, piles of receipts thrown on the ground, upturned couch cushions, bits of marijuana on the edges of counters and an ATM with its doors torn open and emptied. In the residents’ rooms a safe was cut open, dresser drawers pulled open, and rumpled clothes and knickknacks thrown on the ground. 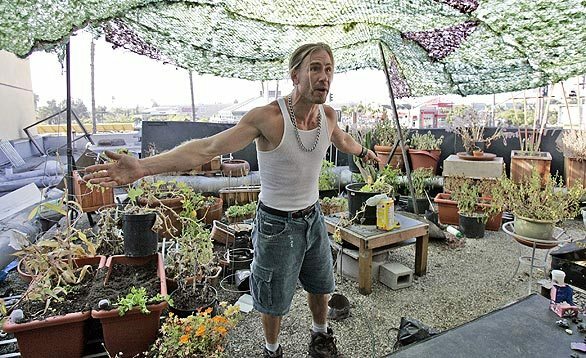 An outdoor vegetable garden had plants uprooted, along with marijuana plants removed by the agents. Brian V. Birbiglia, 35, sat handcuffed next to DEA agents on a tattered couch outside the dispensary for more than four hours during the raid. Next to the couch sat a box marked “DEA evidence,” about a dozen black trash bags and two Trader Joe’s paper bags. Some agents wore protective chest gear, black sunglasses and guns in leg holsters. After the raid was over and he was released, Birbiglia was visibly enraged. An employee and friend of the dispensary’s owner, Jeff Joseph, Birbiglia said he is a disabled former Marine who has a prescription to smoke marijuana for a foot injury. Birbiglia found a remaining bud of marijuana that agents had missed, and he popped it into a pipe to smoke. “They forgot this, and I’m going to smoke it,” he said. Los Angeles Councilman Bill Rosendahl was called to the scene by the owner and arrived several hours after the raid began. Rosendahl, standing outside the gate to the store’s parking lot, said he was frustrated that there was nothing he could do to intervene. The dispensary straddles the boundary between Los Angeles and Culver City, Rosendahl said. Culver City police assisted federal agents at the scene. Clyde Carey, 50, of Marina del Rey was at the store Friday visiting a friend when agents burst in through the locked front door, he said. Carey, who said he has multiple sclerosis and has been a dispensary customer since February, stood across the street near a Starbucks with about half a dozen people who had witnessed the raid, watching agents walk in and out. He said DEA agents searched and cuffed the roughly 25 people inside the building, which also includes four upstairs rooms. Then agents started searching the premises, removing computers, medicine and money, and using a steel cylinder battering ram to get into the upstairs bedrooms, Carey said. Joseph, the owner, said he was at the bank when an employee called to warn him of the raid. In addition, the section titled “Who I’d like to meet” solicits people without a “medical recommendation card” for marijuana. Times staff writer Jia-Rui Chong contributed to this report. If my understanding is correct, the U.S. fed gov doesn’t have the authority to regulate anything not spelled out in the U.S. constitution, and marijuana is outside of it’s purview. Anything not spelled out in the constitution is up to the states to regulate, and from the sounds of the report the state of California says what was going on was within the laws they have. A federal agency in the U.S. should have no authority to do what they did, is my understanding is correct?